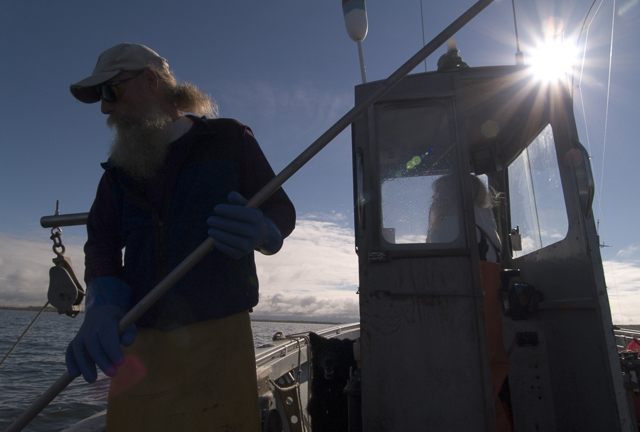 This enhanced podcast takes you on a journey into the lives of Quahoggers (Rhode Island’s shellfishermen,) exploring their traditional (but threatened) way of life. The trade, its techniques and lifestyle have been handed down from generation to generation. Offshore, quahogging is a simple and direct contest between a man and the bay. But in the past decade their ways of life, their industry and livelihoods have become threatened. A job that was once a simple, hard day’s work producing an honest wage has become victim to pollution, politics, sophisticated mass production and manipulative marketing from within and outside their own state. The social and economic trends suggest that in as little as 20 years commercial shellfishing for the quahog will be destroyed in this part of the country. Facing a maze of regulations and declining prices for their catch, many question the viability of the job itself. At the public library in the quahogger-rich town of Warwick, Rhode Island, stands a large statue of a shell fisherman with his bull-rake in hand, bag of quahogs at his feet and dog at his side. The sculpture is meant to be a tribute to the modest, hardworking local men. But with the looming demise of Rhode Island’s quahoggers, it is quickly becoming an early memorial to the men and their once cherished way of life.